4 registered (Watty, petemog, teifistar, Andrew Kidney), 116 Guests and 8 Spiders online. Once you’ve ordered your first Morgan how do you cope with the wait????? Having waited (I may have said this before) for about 28 years, my build start date is Week 6. Factory visit booked for 28th February with possible collection 15th March all being well. The edginess is affecting my working days. The edginess means I spend more time than is healthy looking at anything Morgan related (eg Dave W book, all Forum threads (so far up to page 31/721 “so have you taken...” and up page 4 of the Videos threads)). I’ve now got a ‘at to keep my ears warm when she arrives (thanks to Lady H’s mater and pater). I’ve even made a start clearing sufficient space in the garage to store her. Please advise what is recommended to pass the hours. Or should I be having regular meetings with a psychiatrist? Lady H I believe is fed up with looking across at me when we’ve got back from work and seeing me ignoring the telly, asking me a question and getting nothing more than a teenage style grunt in return coz I’ve got something important in hand such catching up with “Monday humour”. How do I get my life back? Who bleedin’ invented Dry January by the way? Ruddy stupid idea when you have the stress of waiting to cope with. You have been struck down with Morganitius for which there is no known cure. Your best option to spend as much time as possible with other sufferers in the hope you come to view the condition as perfectly normal. For that is what it is - perfectly normal! Search U tube for Morgan videos and ebay for morgan books. Wander round Halfords for hours looking at car care products. Study Morgan dealer websites and prices. Getting others in your family to accept it is another question that I know not the answer. Some attention paid to Mrs H may well be a good idea to gain bonus points once the car actually arrives! But alas the wait will be over one day...…. Mazda MX5+some preserved BL relics. No andymot, you haven’t helped. But a v game attempt nonetheless. Fortunately, living in the middle of nowhere we are nowhere near Halfords otherwise I would have needed an extension built to store all the cleaning things I MUST have NOW. Thank you however for your support and guidance. Clearly someone who has gone through a similar burden. How do I get any sympathy or understanding from Lady H to my plight? 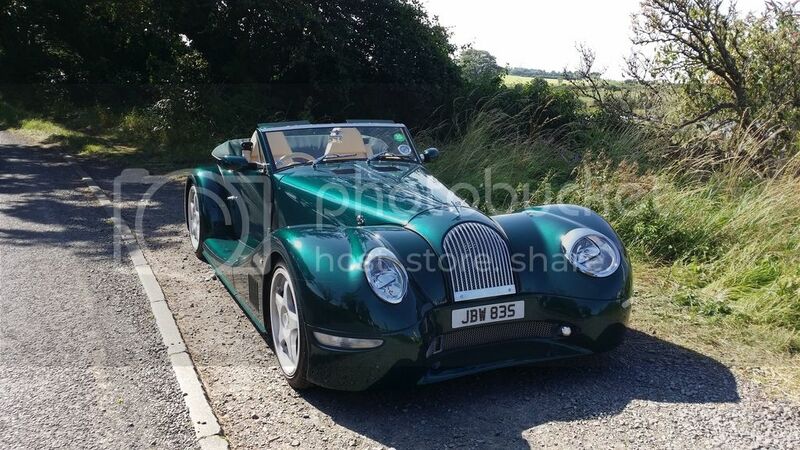 By the way SWMBO does not "get" the Morgan and rarely comes out with me - hence although the engine may be louder it is, in fact, a lot quieter than the Fiesta on most days. I take my 4/4 shopping just for the sheer pleasure of driving her. Many thanks Phil for your time. Nope, once again my symptoms have suddenly got worse. I think I need some medication. Better check the TM site, I’m sure that’ll help. Have now started to look up the events you mention....(checks Fitbit to see what heart rate is first). Is there a way of switching it to the correct place? Then it's a case of sourcing all the various bits you will need and stockpiling them for the big day. There is always the task of finding the ideal clothing for driving your new P&J when it does arrive. This should include the wardrobe for Mrs HB. Then there is the planning of your first touring holiday in the Morgan. Otherwise, all you can do is mark the days off on a calendar and count the minutes. Phil Royle’s advice re MSCC is spot on - get along to your local meeting and see what they have planned. You will also get the chance to look at other cars to help with planning further upgrades.